This unique sofa features large, beautiful flower patterns. The accent pillows add a touch of contrast to this couch, making the flowers and leaves stand brightly at attention. A full length skirt covers the base of this furniture. 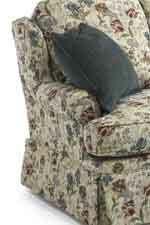 Small, rolled arms bring a touch of comfort to this lovely sofa. The Danville 70" Casual Sofa by Flexsteel at AHFA in the area. Product availability may vary. Contact us for the most current availability on this product. Pillow Includes two 07P-91 pillows.